Ebac is a privately owned British company founded in 1972. Its annual turnover is in the region of £25 million. In its early years the first Ebac Dehumidifiers were produced for industrial use. In 1980 the company developed its first mass produced domestic model. It is the company's proud claim that by creating the first of these appliances for use in the home it effectively created the British market for this product type. The company is, and has always been, based in County Durham in the North East of England. All manufacturing of the Ebac Dehumidifier is undertaken in the UK and the company attributes its success to designing Ebac Dehumidifiers tailor made for the British and Northern European climate. In addition to Ebac Dehumidifiers the company also manufactures water coolers and refrigerators. For more information you may visit the Ebac company website. In addition to tailoring Ebac Dehumidifiers to the UK climate, the company has also developed and patented some technical innovations that it has built into many of its dehumidifiers. "Smart Control™" is Ebac's registered trademark for a device that records and remembers levels of humidity over a 24 hour period and switches itself on automatically to respond to periods of high humidity, such as when you are cooking or showering, that reflect the pattern of life in your individual household. The Ebac Dehumidifier also switches itself off at times it "knows" humidity will be lower, thus saving on energy costs. A second, patented, enhancement is Ebac's "intelligent defrost" system. Refrigerant dehumidifiers have cooling coils on which the water vapour in the air drawn into the appliance condenses. Inevitably these coils can start to ice up in cooler temperatures which reduces the machine's efficiency. "Intelligent defrost" predicts the onset of freezing and suspends the refrigeration process long enough for the coils to defrost. This innovation is faster and more efficient than the more common "auto-defrost" system and cuts the cost of running your Ebac Dehumidifier still further. The third way that the Ebac Dehumidifier's efficiency has been improved is by the installation of "hydrophilic coils". These coils are coated with a substance that increases the rate at which water runs off the coils. This accelerates both water extraction and collection which helps further to improve the efficiency of the Ebac Dehumidifier and saves energy. 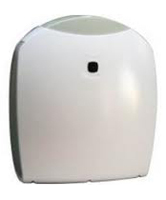 Ebac Dehumidifiers are by no means the cheapest in their class to buy. Their advantages are sound construction and energy saving technology which makes the lifetime cost of ownership of an Ebac dehumidifier competitive with other appliances with a lower purchase price. Additional costs to be factored in to the equation are those for accessories. A continuous drainage facility is a godsend if you are unable to empty the water container every time it is full, often a couple of times per day. Many of these appliances are equipped with this capacity but few supply the additional drainage kit required as standard. Ebac are no exception and their purpose designed drainage kit comes as an optional extra. If your unit is of reasonable size and weight, and equipped with a carrying handle, moving it from one place to another within the home is not an issue for most of us. Castors or wheels can be a welcome benefit for anyone, however, and an essential one for others. An optional set of castors is offered with Ebac portable models at an additional cost. On this point some may feel that the castors should be included in the initial purchase price of an Ebac Dehumidifier. Carbon filters and "Bactiguard" filters for Ebac Dehumidifiers are also offered at additional cost. The benefits are a reduction in odours, from smoking and pets for example. They are an optional extra for those who want them. The primary purpose of the filter is to protect the working parts of the machine from airborne debris. Filters will normally have a life of months and years and only require the gentle application of a soft brush every couple of weeks to keep them functioning properly. The smallest capacity (12 litres in 24 hours) model in the domestic range is the Ebac Amazon 12, rated as suitable for a 2 bedroom home. The newest addition to the Ebac range is the Amazon 15 which, as its name suggests, has a water extraction rate of 15 litres in 24 hours, and will cope with a house with up to three bedrooms. Less sophisticated than the other series the Amazon is a sound, basic and moderately priced unit for the occupiers of small and medium sized homes. While lacking "Smart Control™" and "intelligent defrost" these machines are equipped with an adjustable humidistat, a feature not always available on models in this price bracket. With the 2000 series Ebac Dehumidifier the company has included all their patented technology in two machines of greater capacity. The added power and sophistication of these machines is naturally reflected in a higher price. The Ebac 2650e will extract 18 litres per day and is powerful enough for a house with up to 4 bedrooms. Its "big brother", the Ebac 2850e boasts an extraction rate of 21 litres and will control humidity in a home with 5 or more bedrooms. Although more expensive these models justify the extra investment with the added flexibility they offer. The "intelligent defrost" feature will allow them to operate at temperatures down to 3°C, making them suitable for use in cooler places, cellars, basements, conservatories etc., rather than being restricted to living areas where the temperature is usually 15°C or higher. The two models in the Ebac Powerpac series have similar performance to their Ebac 2000 cousins but in a rather more compact package. The Ebac Powerpac 18 will extract 18 litres per day while the Powerpac 21 will handle 21 litres, corresponding to a 4 or 5 bedroom house respectively. While slightly wider than the 2000 series the Powerpac is 3 centimetres less in depth and nearly 10 centimetres shorter than the 2000. These dimensions may fit better into a discreet corner, or perhaps a low shelf, than the larger machine. The design is also more stable, with its lower centre of gravity, and less likely to be knocked over by a lively dog or playful child. This compact Ebac Dehumidifier design comes with a slightly higher price but it may suit your circumstances more exactly than the 2000. With the Ebac 6000 series the water extraction rate climbs higher and the casings have been designed for a cleaner, more "eye friendly" effect. The Ebac 6100 has an extraction rate of 21 litres per day and all the technical benefits Ebac can offer. The Ebac 6200 increases the extraction rate to 25 litres. For slightly larger 4 or 5 bedroom homes the extra capacity is an advantage and the design, together with the colour options, unique to this series, should blend more easily into the style of the room into which it is placed. The Ebac 6100 comes in four colours, "White", "Blonde Oak", "Mahogany" and "Silver and Steel". "Silver and Steel" is particularly suitable for some kitchens and modern living spaces. The Ebac 6200 is offered in "Blonde Oak", "Mahogany" and "Silver and Steel". Please be aware that each colour option comes at a different price with "Silver and Steel" being the most expensive. For the really decor conscious there is the Ebac Homedry 6000. Its specification is similar to the Ebac 6200 but the appliance sits inside a Mahogany finish cabinet that, when closed, looks for all the world like an item of classic furniture. This Ebac Dehumidifier "in disguise" comes with a significantly higher price than any other Ebac machine and will appeal to those for whom the price of style is a price worth paying. The final model in the Ebac dehumidifier portable range is the Powerdri. This is an 18 litre per day unit finished in yellow. The Ebac Powerdri will operate at temperatures down to 2°C. Some may consider the colour a little bright for domestic use but it will do a similar job in any situation to the Ebac 2650e. It may appeal to anyone who wants a unit for their garage, or to dry out a newly plastered room, as its appearance is ideal in a working environment. The Ebac CD30 is a commercial unit designed for smaller areas of up to 400 square feet. It is equipped for operation in low temperatures and will operate effectively right down to 33°F/1°C. The CD30 is equally suitable for permanent installation or for transfer between sites as required. It is very compact and weighs only 50lb. The CD30 is strongly built and can withstand frequent movement and minor impacts without damage. Although designed for commercial use the CD30 is an excellent choice for individuals who live in the cooler regions and may need a dehumidifier for a boat or a garage. Although more expensive than a standard home model the CD30 is one of the very few dehumidifiers sold in the USA with "hot gas defrost" which is the feature that allows its exceptional low temperature performance. The Ebac CD35 is a portable dehumidifier designed for commercial and industrial applications. With its casters and carrying handle it is an ideal unit for use in a business in which a permanently installed unit may be inconvenient or unsuitable. Like other Ebac units the CD35 is tough and built to cope with harsh conditions, including ambient temperatures close to freezing point. The water extraction rate of the CD35 is 17 pints per day at AHAM rising to 48 pints at saturation. This unit is recommended for use in smaller areas not exceeding 500 square feet. The Ebac SPP6A is a low capacity unit designed to protect high value items stored by the armed forces of NATO countries. This application demands very high reliability and the internal components are designed for long life and specially protected against corrosion and other deterioration to minimize maintenance. Security is important to military users so the appliance is supplied with a remote monitor box to minimize the number of occasions on which the sealed storage facility must be opened to allow physical access. The armed forces are not alone in storing high value, moisture sensitive items in secure facilities and the SPP6A has a ready market among those industrial and commercial organizations which have a similar need. The Ebac CD60 is an industrial unit intended for medium sized areas to a maximum of 1500 square feet. At AHAM testing conditions the CD60 can remove 56 pints of water per day but is optimized for performance in much lower temperatures. The CD60 is made to withstand harsh operating conditions and is strongly built with a robust exterior cabinet and high quality components. This unit can be used in free-standing mode or in a permanently ducted installation to suit your requirements. The Ebac AD850E is a commercial model and combines excellent performance with a pleasing appearance. Appearance is important when a dehumidifier is used in public areas, such as hotels, offices and museums, for which the AD850E is designed. The AD850E is a powerful unit with a water extraction rate of 87 pints per day at 80°F and 60%RH and will operate effectively in spaces of up to 1700 square feet. In keeping with the applications for which it is designed the AD850E will perform optimally at ambient temperatures above 60°F and is not a low temperature dehumidifier. The Ebac WM80 is purpose designed for wall mounting and styled to be inoffensive to the eye. These characteristics make the WM80 equally suitable for commercial applications in public areas or for use at home in locations such as a finished basement. The WM80 is also relatively quiet in operation with a noise output no higher than a typical 70 pint portable model. Despite the attention to aesthetic details the WM80 has the advantage of being able to operate effectively in cold conditions which may be found in both commercial and domestic premises when heating systems are not operating. Wall mounting increases the effectiveness of the standard gravity fed continuous drainage although an internal condensate pump may be specified at an additional charge. The WM80 has a water removal rate of 56 pints per day at the AHAM standard. The Ebac WM150 is similar in design and function to the WM80 but has a larger water removal capacity of 71 pints per day (AHAM). The WM150 shares all the features and advantages of the WM80, including rubber feet to reduce noise caused by vibration if a floor-mounted installation is preferred. The unit incorporates a high performance, cross flow fan which improves energy efficiency and helps to keep the noise level down to a tolerable 58dB. The WM150 is suitable for a large range of commercial applications in which an unobtrusive appliance is preferred but where low temperature operating capability is a must. The Ebac CS60 has a water extraction capacity of 56 pints per day (AHAM) and is recommended for use in areas of up to 1500 square feet. The CS60 is remarkably compact, to fit into tight spaces, but is strongly built as its weight of 63lbs suggests. This model is designed for demanding commercial and industrial applications where a low temperature unit requiring little maintenance is essential. These qualities make the CS60 equally attractive to home owners looking for a reliable dehumidifier for use in a crawl space to which they may find regular access difficult. The Ebac CD85 is one of the most recent additions to the Ebac commercial range. This unit is aimed at commercial and industrial operators who need a unit for a medium sized area with a total air space volume of around 8500 cubic feet (230 cubic metres). The CD85 is pleasingly quiet and will not disturb the concentration of your office staff or be offensive to the ears of your customers, clients or other visitors. This Ebac dehumidifier can operate effectively across a broad temperature range but it is not designed to control humidity in extreme conditions, for which a more sophisticated, and more expensive, model would be needed. Although labelled a "commercial" dehumidifier the Ebac CD85 will also suit private householders who have a humidity problem in an exceptionally cold basement or other area in or around their home. The Ebac K100P is a heavy duty industrial unit reliable and durable enough for use in remote locations that are not attended full time. The K100P includes an internal condensate pump with 20ft lift capacity or 100ft horizontally. Although the K100P will be used mainly for permanent or semi-permanent applications it is portable so may be relocated where this suits the need of the operator. For permanent installation the K100P may be ducted, an important feature in view of its capacity to control humidity throughout an area of up to 3000 square feet. The K100P will operate well in cooler conditions and is suitable for a variety of industrial and commercial applications, or in a larger basement in an area with a colder climate. The Ebac CD100E is a high capacity industrial unit capable of handling humidity control in areas of up to 3000 square feet. The CD100E provides flexible installation options and may be used in stand-alone mode or ducted, either for use outside the area requiring humidity control or to control moisture levels in a number of smaller enclosures. For added convenience the CD100E may be wall-mounted making this compact unit even more suitable for areas where space is at a premium. The CD100E is capable of operating effectively at low temperatures and has an "hours run" meter. The Ebac PD200 is a very powerful unit capable of removing 200 pints of moisture from the air at AHAM standard testing conditions. The PD200 is suitable for a variety of demanding applications including low temperature industrial environments and high humidity areas such as swimming pools and spas. Its high power results in a high operating noise level and the PD200 is configured for a ducted installation in order to keep that noise away from public areas where it may be intrusive. In other applications where noise is not an issue the PD200 may be installed as a stand alone unit if required. The 87 pints per day Ebac PD120 is best considered alongside the higher capacity PD200. Although a single PD120 may be powerful enough for some applications the 120 and the 200 were designed together for applications in which a single unit would be insufficient. Virtually identical except for their capacities the two units provide operators with the option to employ a number of dehumidifiers which together match their needs without "wasting" capacity and therefore energy. By combining 120 and 200 models together the capacity invested in by the operator may be tailored more precisely to the size of the area in which humidity control is required. The Ebac CD425 is a massively powerful industrial/commercial unit which is capable of removing 285 pints of water per day at AHAM and up to 400 pints in more severe conditions. The CD425 can control humidity across an area of up to 10000 square feet and for even larger areas multiple units may be used. This dehumidifier operates effectively across a temperature range of 33-95°F (1-35°C). The unit can be employed as a free-standing dehumidifier and is suitable for ducted installations if preferred. The CD425 is remarkably quiet for its power with a noise output of 69dB. The Ebac FreeStar is a new model of commercial/industrial dehumidifier from Ebac. The FreeStar is suitable for use in areas where the temperature is very cold, very warm or fluctuates between the two extremes. The unit is compact but heavy and although it can be moved is more suitable for a permanent installation. The FreeStar is effective but a little loud and is more suitable for storage and processing areas than for establishments which host customers and other visitors. This Ebac Dehumidifier is not an ideal choice for use in basements or other parts of private homes for reasons I explain in my review. The Ebac CD200 is a powerful commercial unit with a water extraction rate of 138 pints per day. This model is very robust and can operate at low temperatures. It is entirely suitable for use in hostile environments such as those found on ships and oil rigs. The CD200 is a compact unit for its size but is heavy and has a relatively high noise output. It is also quite expensive in comparison with some other models. While the CD200 would be effective in the more moderate conditions found in many commercial applications this new Ebac dehumidifier may not be the best choice for the operators of these facilities. The Ebac DD200 is an industrial desiccant unit and the lowest capacity model in the Ebac "DD" range. A particular advantage of a desiccant dehumidifier is its ability to operate effectively at temperatures below the freezing point of water. The DD200 is capable of controlling humidity at temperatures as low as -4°F/-20°C. Although the amount of water extracted at such temperatures is very low extreme dryness can be achieved which can be of extreme importance to some manufacturing processes and for storage of moisture sensitive items. Midway between the DD200 and DD400 is the Ebac DD300. In addition to low temperature operation desiccant units are also able to operate effectively in very warm conditions. The DD300, in common with all the "DD" range, can perform well at temperatures as high as 104°F/40°C. Even at these high temperatures a desiccant dehumidifier can create far drier conditions than the most effective refrigerant models and there are many applications in industry, commerce and medicine, for example, where this is essential. This impressive drying power comes in a very small package. The DD300 measures just 14 x 16 x 14.5 inches. The most powerful unit in the "DD" range is the Ebac DD400. The DD400 can extract as much as 81 pints of water per day at AHAM, twice as much as the lower capacity DD200. The DD400 shares all the advantages of the other "DD" models. The main disadvantage of a desiccant dehumidifier is its higher energy cost compared with a refrigerant unit. For operators of desiccant models this disadvantage is more than offset by the benefits provided. Some processes would be impossible without the use of a desiccant dehumidifier. In addition a desiccant dehumidifier is more reliable than a refrigerant model. Although the desiccant process is sophisticated a desiccant dehumidifier is simpler mechanically and does not generate the stresses created within a refrigeration system. The Ebac BD80 is designed specifically for water damage restoration and related applications. As well as performance and durability the BD80 is designed for one person operation, an essential requirement for many restoration specialists. Equally important are the BD80's compact dimensions, manoeuvrability and capacity for low temperature operation. These qualities make the BD80 attractive for use in other industrial and commercial applications, particularly where a portable unit is required. The BD80 has a water removal rate of 56 pints per day (AHAM) and is suitable for areas of up to 1500 square feet. For restoration work requiring more capacity than the BD80 Ebac offers the Ebac Orion. The Orion provides a daily water extraction capacity of 105 pints at AHAM testing conditions which is sufficient for an area of up to 1800 square feet. This Ebac dehumidifier includes all the features and capabilities of the BD80 and incorporates an internal condensate pump. Like the BD80 the Orion is suitable for other demanding commercial and industrial applications, particularly where effective low temperature operation is required. The Ebac Neptune is a portable unit designed for restoration projects in flooded buildings. Like all restoration models the Neptune is built to resist the occasional impacts it is bound to receive in this kind of work. It is also able to withstand frequent movements between jobs and is compact and light enough to be transported in a small vehicle. With the capacity to operate effectively at temperatures just above freezing point the Neptune is suitable for a variety of other commercial and domestic applications. The Ebac Triton is a water damage restoration unit. Its features include "hot gas defrost" for low temperature operation and an internal pump to discharge the condensate. The Triton is portable and is fitted with a pair of wheels and a handle to make movement on site and between sites easier. This Ebac Dehumidifier is suitable for operation by a single individual and will be effective on smaller projects with its 51 pints per day (AHAM) water extraction capacity. The Triton is well equipped for many other commercial applications and will be of interest to home owners who need a low temperature unit for use in a basement or garage. The Ebac Kompact is an improvement on previous Ebac restoration models in being more compact and easier to use yet no more expensive. The Kompact has a water extraction rate of 56 pints at AHAM and may be used in areas not exceeding 1000 square feet. This Ebac Dehumidifier is fitted with an internal condensate pump and an hour meter. The Kompact is tough and reliable and can operate across a wide range of temperatures extending down to 33°F/1°C. The Ebac BD150 is a tough and powerful portable unit configured for restoration projects and construction drying operations. The BD150 is powerful enough for restoration work in an area of up to 1800 square feet and will pull 67 pints of water per day from the air at 80°F/27°C and 60%RH. This Ebac Dehumidifier is heavy at 146lb but can be operated by one person and has wheels and a handle to make movement easier. Despite its weight this dehumidifier is very compact. The standard BD150 is configured for continuous drainage by means of a gravity feed but the BD150-CR is also available with an integral condensate pump if required. The Ebac RM65 is a new addition to the range of Ebac Dehumidifiers designed for water damage restoration professionals. It is Ebac's first restoration model with a roto-molded housing and part of a two model range which now includes the even more powerful and capable RM95. The RM65 is a "basic" unit by the standards of restoration units and, although entirely fit for its purpose, will be most suitable for use in less demanding projects in which more capable, and more expensive, dehumidifiers are not required. The Ebac RM65 is competitively priced and, with its 80 pints per day water extraction rate, provides exceptional "bang for the buck". This model is suitable for a range of other commercial applications and will also appeal to home owners who need an affordable and reliable dehumidifier for a cold basement, large workshop or garage. The Ebac RM95 is the second new roto-molded water damage restoration unit to be introduced by Ebac during recent months. Although only marginally larger than the RM65 the new model has a water extraction rate of 105 pints per day at AHAM, 25 pints higher than the RM65. More importantly the RM95 is suitable for a greater variety of restoration projects due to its increased sophistication. The operating temperature range of the RM95, for example, now extends from 32-113 degrees F compared with the 41-90F range of the RM65. This new Ebac dehumidifier is suitable for a range of other commercial applications and may be attractive to some private buyers for use in a basement. The Ebac RM95 is offered at an attractive price and represents good value for money.